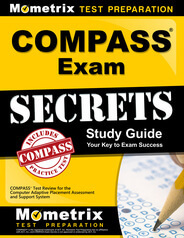 Prepare with our COMPASS Study Guide and Practice Questions. Print or eBook. Guaranteed to raise your score. Get started today! The COMPASS is actually a group of exams created by the American College Test Program (ACT) that are designed to evaluate a particular individual’s math, reading, and writing skills. The exam is most commonly used in university settings as a means of determining exactly what courses a particular student should be placed in based on their level of ability. These exams are computer-adaptive exams and the questions that the individual receives are therefore based on whether or not the preceding question was answered correctly. If the preceding question is answered correctly and the student is not already at the hardest level of questions, the next question will be harder. However, if the student answers incorrectly and the student is not already at the lowest level of difficulty, the next question will be easier. COMPASS Flashcards. 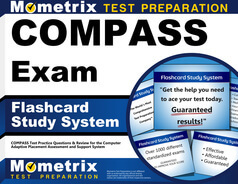 Proven COMPASS test flashcards raise your score on the COMPASS test. Guaranteed. Each question is multiple-choice, but the exact number of questions varies from student to student depending upon how skilled the student is in a particular area. 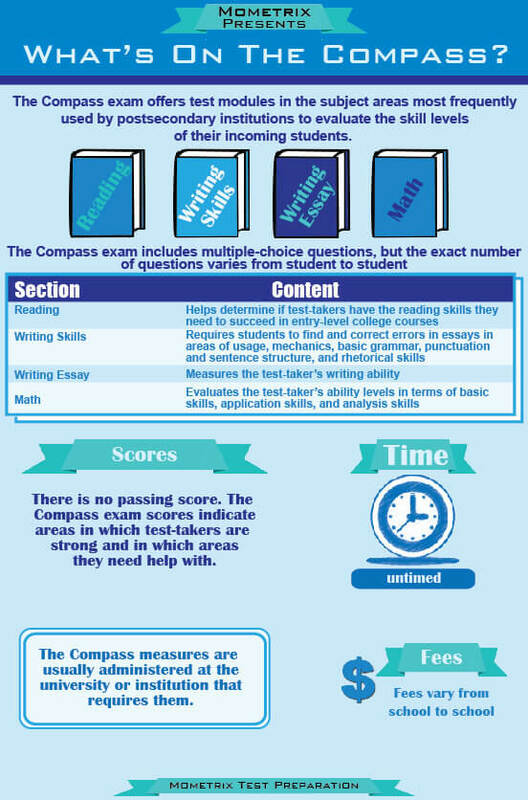 The COMPASS consists of three main exam groups known as measures, which includes a mathematics measure, a reading placement measure, and a writing skills placement measure. The COMPASS also has a measure for English as a second language designed to test a student’s ability to understand written and spoken English. These exams are separate and an individual may be required to take an individual exam rather than all of the exams or any combination of these exams. The mathematics measure covers five areas including numerical skills and pre-algebra, algebra, college-level algebra, geometry, and trigonometry. The reading placement measure includes passages and questions related to those passages regarding topics such as the humanities, practical reading, prose fiction, natural sciences, and social sciences. The writing skills measure examines the student’s ability to correct errors in basic grammar, usage, punctuation, and sentence structure as well as the student’s ability to improve the style, organization, and content of a particular piece of writing. Each exam is scored based on the percentage of questions answered correctly. This percentage is weighted based on how many responses are answered at each difficulty level. The COMPASS measures are usually administered at the university or institution that requires them. As a result, the registration procedure, course placement, and fee, if any, depends on the specific university or institution.